A new introduction and a garden-winner for 2019! 'Mango' is a striking and reliable new form of Middendorff weigela, bred by award winning UK nursery Hilliers. 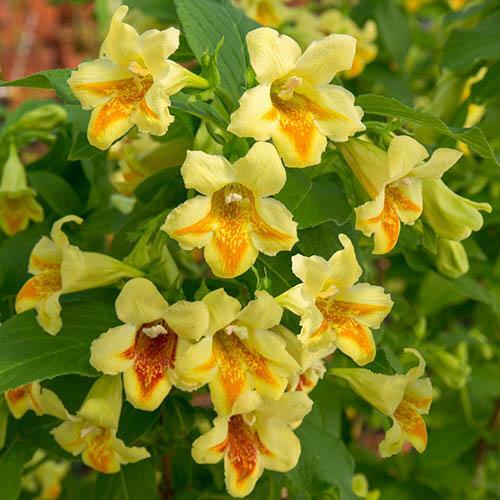 Only recently available to home gardeners, this is a much sought-after plant due to its clusters of creamy-yellow trumpet-shaped flowers, each with a distinctly mottled orange throat which changes from yellow to orange as the flower matures. When the leaves emerge in spring, it forms a neat, upright mound of lush leafy stems, topped with its gorgeous flowers. Set to be much in demand in 2019, make sure that you don't miss out! 'Mango' is a striking and reliable new form of Middendorff weigela, bred by award winning UK nursery Hilliers. Only recently available to home gardeners, Mango is a compact shrub with lush, bright green leaves and clusters of creamy-yellow trumpet-shaped flowers. Emerging from its winter dormancy in spring, 'Mango' forms a neat, upright mound of luxurious leafy stems, topped with its gorgeous flowers - each with a distinctly mottled orange throat which changes from yellow to orange as the flower matures. An ideal plant for gardeners with little time for fussy maintenance, Mango is fully winter hardy, really easy to grow and always gives good results - grow it in a flower border or in a container on your decking, patio or balcony, it's the perfect low maintenance plant! Set to be much in demand in 2019, Weigela Middendorffiana 'Mango' is supplied as an established plant in a 3L pot, eventually reaching 150 x 150cm - make sure that you don't miss out! Weigelas are happiest in a sheltered position in fertile, slightly moist and well-drained soil, preferably in full sun or dappled, light shade. Backfill the planting hole and firm the soil and water well. Naturally branching so no need for time-consuming pruning, just cut back after flowering; cut back flowering branches by at least two thirds to encourage growth of new shoots that will flower in the following season.